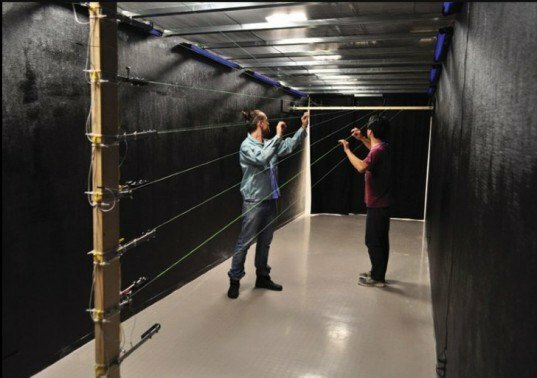 Artists Convert Cargo Container Into a Giant Working Guitar! We've seen plenty of shipping containers transformed into everything from offices, homes, and even a fancy restaurant outside of Paris. But here's an application we'd never thought we'd see -- the CargoGuitar is the product of an artistic collaboration from the Kobe Biennale in Japan, which converts a cargo container into an enormous, playable guitar. Artists Marcelo Ertorteguy, Takahiro Fukuda, and Sara Valente created this immersive sound experience that allows visitors to feel and see what it is like inside a giant guitar. CargoGuitar consists of eight giant steel strings stretched across the interior of the container in a half-twist design. The horizontal bar at one end of the strings holds them in place and frames the cargo entrance. The vertical end is outfitted with tuning pegs that can actually change the sound scales of the instrument! For those who want to practice their Freebird solo, CargoGuitar is in fact electric, featuring two 1/4 inch input jacks plugged into corresponding amplifiers. While exploring the inside of a massive guitar is a visual experience in itself, the artists were also interested in the kinetic vibrations and physical responses to the space. With this in mind, they made sure the guitar strings glowed in the dark, allowing visitors to experience the interactive sound container through different visual atmospheres. With the lights off, visitors can choose to close their eyes and feel the guitar’s resonating vibrations or open them to witness the glowing strings dancing in the dark while being played. Defying what many often think of architecture, sound, and art, CargoGuitar won an award in the Art in a Container International Competition and will be on view at the Kobe Biennale in Japan for the rest of the month. CargoGuitar consists of eight giant steel strings stretched across the interior of the container in a half-twist design. The horizontal bar at one end of the strings holds them in place and frames the cargo entrance. The vertical end is outfitted with tuning pegs that can actually change the sound scales of the instrument! For those who want to practice their Freebird solo, CargoGuitar is in fact electric, featuring two 1/4 inch input jacks plugged into corresponding amplifiers. While exploring the inside of a massive guitar is a visual experience in itself, the artists were also interested in the kinetic vibrations and physical responses to the space. 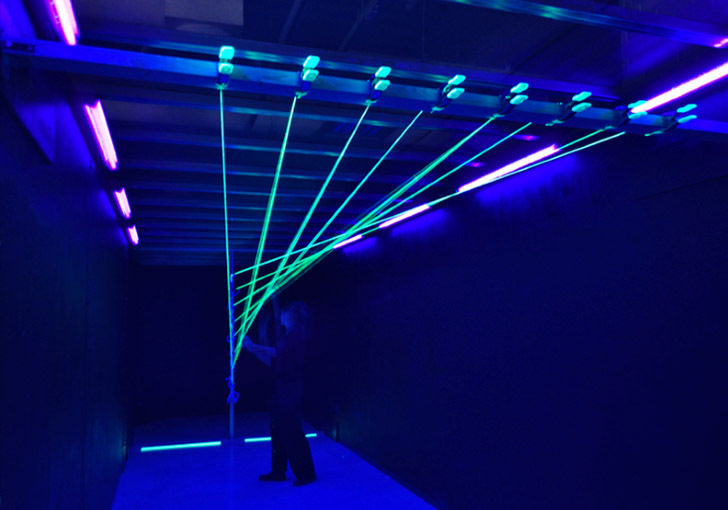 With this in mind, they made sure the guitar strings glowed in the dark, allowing visitors to experience the interactive sound container through different visual atmospheres. With the lights off, visitors can choose to close their eyes and feel the guitar's resonating vibrations or open them to witness the glowing strings dancing in the dark while being played.